Cambridge United's squad were not performing to their true ability with Richard Money in charge, says U's chief executive Jez George. 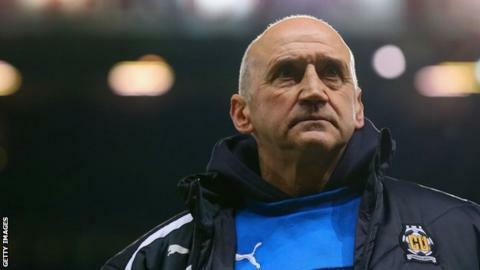 Money, 60, was sacked on Monday with the club 18th in League Two having won eight of their last 41 matches. "There was a pattern of results over a prolonged period of time, not just this season," said George. "We feel the potential of this squad was not reflected on the pitch; we feel we're under-achieving." He told BBC Radio Cambridgeshire: "We've made the decision at a point where we feel there's enough time in the season that if we make the next decision a right decision we can have a successful season." Assistant boss Joe Dunne is expected to take charge of the U's when they take on Basingstoke in the FA Cup first round on Saturday. Money, who took over at the Abbey Stadium from George in October 2012, led the U's to promotion back to the Football League in 2014, winning the FA Trophy in the same campaign. He also led his side to a lucrative FA Cup third round tie against Manchester United last season which they lost in a replay at Old Trafford. He signed 10 players on permanent deals this summer, including highly-experienced striker Barry Corr and defender Leon Legge, but the side have struggled with injuries and won five games all season. Money said in a statement released through the League Managers' Association: "Despite a run of unprecedented injuries at the start of this season the team remain just six points outside of a play-off position. "Once all of the key players are fit and available for selection I am positive that I would have achieved a top seven finish this season and I am therefore disappointed not to have been given the opportunity to achieve yet more success with this great football club." New Mills - worst team in England? Read more on New Mills: The worst team in English football?